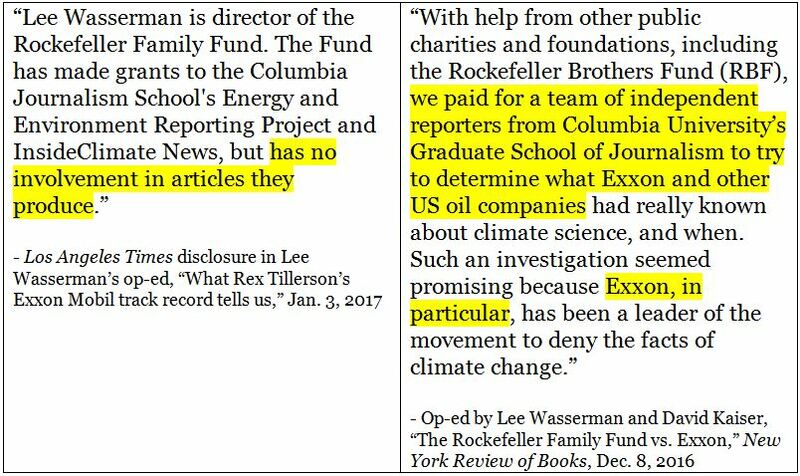 Lee Wasserman, Director of the Rockefeller Family Fund, has changed his story again in a new op-ed in the Los Angeles Times, now claiming that his organization had no involvement in the Columbia School of Journalism’s anti-Exxon stories. This comes less than a month after his op-ed in the New York Review of Books where he admitted to paying the Columbia journalists to specifically target Exxon. Wasserman is trying to have it both ways depending on whatever best suits the argument he’s trying to make at that moment. One moment he takes credit for the anti-Exxon “journalism” his organization paid for, and the next he feigns innocence as an impartial supporter of investigative reporting. Wasserman has been a central actor in the #ExxonKnew campaign. His organization is funding every component of the coordinated assault on Exxon, paying for research papers, buying media coverage, and funding activists who drum up attention and outrage against the company. The LA Times has served as the mouthpiece of the Rockefellers for more than a year now. They published the original Columbia School of Journalism stories last fall. They followed those with an op-ed by Neva Rockefeller Goodwin, a former Rockefeller Brothers Fund trustee who is at the forefront of the effort to drive divestment from fossil fuel companies. The LA Times has also published two editorials calling for investigations of Exxon, with the most recent editorial running less than a week ago. And now they’ve published this latest piece of propaganda from Wasserman. The LA Times does seem to have learned one lesson – they finally disclosed their financial connection to the Rockefellers at the end of Wasserman’s op-ed. Every other #ExxonKnew piece the outlet has published has, at least initially, failed to disclose that their reporting on Exxon was funded by the Rockefellers.